If you see small green worms on the undersides your kale or other brassica plants, you've got cabbage worms. Cabbage worms are the larval form of the cabbage white butterfly (Pieris rapae, or Artogeia rapae). There are several types of worms that are called cabbage worms, but two species are the most common and the most damaging to garden vegetables. In addition to cabbage, the worms can feed extensively on broccoli, cauliflower, Brussels sprouts, collards, kale, mustard greens, turnip greens, radishes, turnips, rutabagas, and kohlrabi. 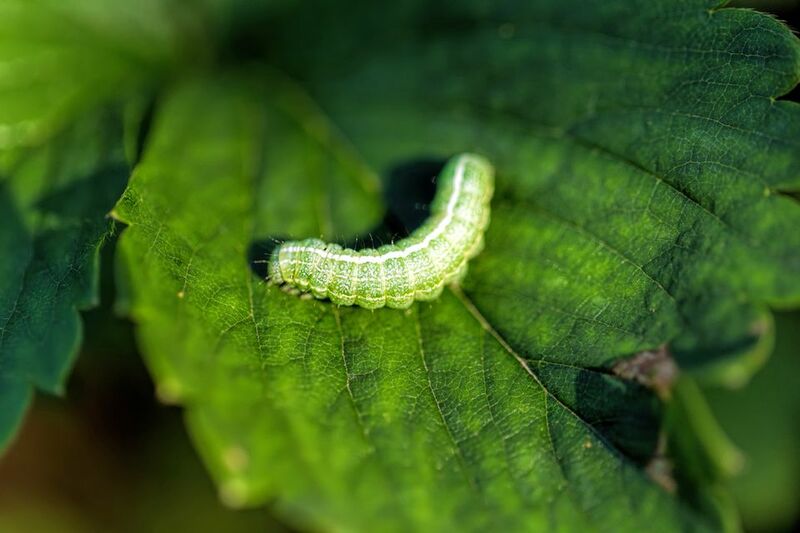 It is useful to know what both the larva and the butterfly look like because seeing either near your plants most likely means that you'll start seeing damage to your brassicas (such as cabbage, broccoli, and kale.) The cabbage white butterfly has off-white wings, with one or two grayish-black spots per wing. The wingspan is roughly 2 inches across. The larva (the worm that does the actual damage) is a velvety green, inchworm-type caterpillar that is roughly 1 inch long. The eggs of the larvae are found on the undersides of leaves and are yellow and oval-shaped. The larva builds a chrysalis in the fall and hatches as the cabbage white butterfly in spring. The butterfly feeds on nectar and lays single eggs on the undersides of plants of the brassicas family. The eggs hatch in five to seven days. The larva (cabbage worm) feeds voraciously on brassicas, building up the energy to make its chrysalis and metamorphose over the winter. Because of their voracious appetite, an "infestation" can be as few as two or three worms per plant. Look for holes being chewed from the centers of leaves from worms on kale and cabbage, as well as entry holes chewed to the interior of heads of cabbage. In particular, look on the undersides of leaves, because this is where the cabbage worms usually hang out. They also produce dark green droppings that are fairly noticeable. A serious infestation of cabbage worms can result in the death of the plant, since the more leaves that the cabbage worm manages to eat, the less the plant has the ability to photosynthesize. A minor infestation can make plants look unsightly but won't render them inedible. Just wash them carefully and inspect cabbage and broccoli for any cabbage worms that have made their way to the interior of the heads. Prevent infestation in the first place by protecting your plants with floating row covers, especially in spring and early summer when egg-laying activity is at its highest. Prevent worms from burrowing into cabbage heads by covering each head with a nylon stocking. Leave it on until you harvest the head. Repel the pests with a repellant drench made from a puree of spearmint, green onion, garlic, horseradish, hot peppers, peppercorns, and water mixed in a blender. Add 1 tablespoon of liquid soap per quart of mix and spray it onto the plants. Make a caterpillar-deterrent citrus spray by grinding up rinds and seeds of any citrus fruit, then soak it overnight in 2 cups of water. Strain the pulp and add 2 teaspoons of liquid soap to the mixture and spray it onto the plants.